At last, my final painting told me: 'Ding!' It's done. I asked my friends on Facebook for suggestions on the title - the working title was The Treat. which is exactly what these two ladies are doing. 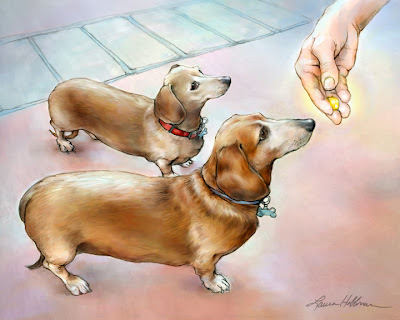 The gold is in hand, and it's all about IT, the goal, the treat. I am getting ready to show new work over the weekend at the annual summer SCBWI conference that begins tomorrow! This painting will be part of the Penelope series. Lately, being surrounded by wiener dogs (dachshunds) has really affected my choice of subject matter. We paint what we see, what we think about and what we love. This series will end up being part of a book - a work in progress coming to you soon.